Nothing puts the finishing touches on a handmade project like a label. I use to try the printable paper with fear it would bleed into the fabric or completely fade away, and it did. Then I went as far as embroidering my labels which took longer than the project itself. Finally I found Wunderlabel. Not only did they make the ordering process quick and simple, it arrived just as fast. Now my favorite part of finishing a new design is that final detail of sewing my custom labels on. Take your project to the next level of professionalism with Wunderlabel. You and your projects earned it. You will discover a wide range of colors and fonts, or create your own. They have woven clothing labels, sewing labels, care labels, and personalized ribbon. It took me about 10 minutes to customize my labels and order them from start to finish. The reasonable prices make it fine to try a few different options as well. I received them within the week of ordering (standard delivery is up to 2 weeks with an option to expedited shipping). Start with the type of labels you'd like to order here. I went with a standard woven label, Pacifico font, and enhanced color. This is important if you want a light background and dark text. It will prevent the dark text from affecting the background color. 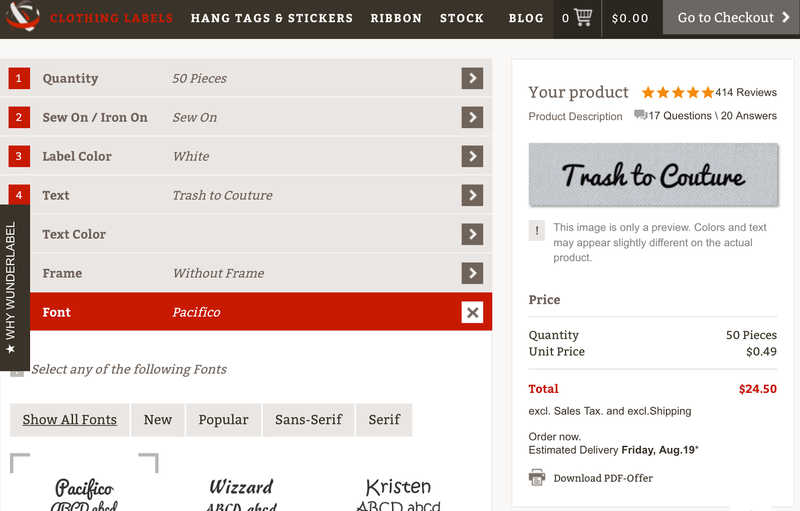 Simply follow the set of steps to customize your labels from quantity down to font, color, and more. You can even add your own logo. I chose the sew on labels, but you can also choose iron on as another option. I didn't even wait a second to sew my T2C labels on all my designs. Simply sew along the side edge. Nothing like supporting Team USA like a "Made in USA" to add here. Another product I like is the care labels, especially when it comes to hand-dyed and organic fabrics that I use. This is just as important as the brand label if you plan to sell your designs. Finally feeling like a legit brand thanks to Wunderlabel. Use discount code T2C10 for 10% off your entire order. Great content. Visit our website for make labels with lowest rate. Designing your own clothing label is a great idea and creative. Wunderlabel is giving the general public an opportunity to design you own clothes. You have to write an prices writing about your design and then start working on it. This way, you will become a good graphic and clothing designer. To see progressively about word squeeze we can peruse this blog till end. it would be extremely incredible for the perusers to peruse this blog particularly papersplanet individuals can have advantages of this blog. I should state we should peruse and impart this blog to an ever increasing number of individuals.